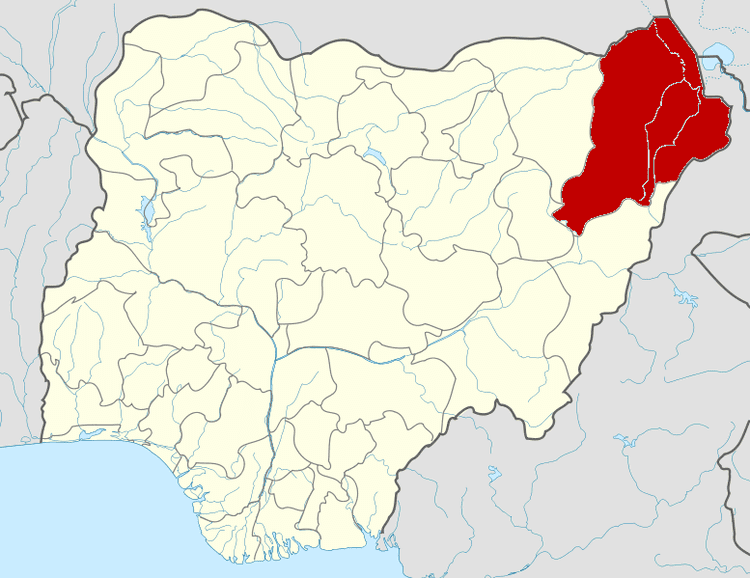 Borno, also known as Borno State, is a state in north-eastern Nigeria. Its capital is Maiduguri. The state was formed in 1976 from the split of the North-Eastern State. Until 1991 it contained what is now Yobe State. The state is dominated by the Kanuri people. Other smaller ethnic groups such as Lamang, Babur and Marghi are also found in the southern part of the state. Shuwa Arabs are mainly the descendants of Arab people and is an example of the endurance of traditional political institutions in some areas of Africa, where the emirs of the former Kanem-Bornu Empire have played a part in the politics of this area for nearly 1,000 years. The current Kanemi dynasty gained control of the Borno Emirate in the early 19th century after the Fulani jihad of Usman dan Fodio. 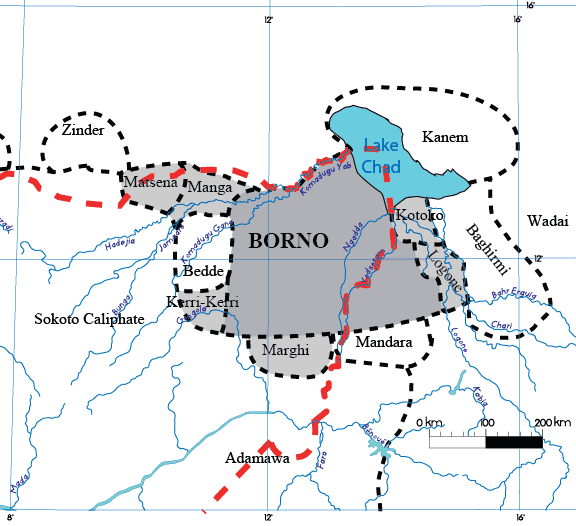 Conquered by Rabih in 1893, Borno was invaded by the British, French and Germans at the beginning of the 20th century. 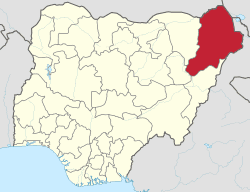 In 1902, the British officially incorporated Borno into the Northern Nigeria Protectorate and established a new capital at Maiduguri or Yerwa in 1907, which remains the capital to this day. After Nigerian independence in 1960, Borno remained fairly autonomous until the expansion of the number of states in Nigeria to 12 in 1967. Local government reform in 1976 further reduced the power of the emirs of the former dynasty, and by the time of Nigeria's return to civilian rule in 1979, the emirs' jurisdiction has been restricted solely to cultural and traditional affairs. The emirs still exist, and serve as advisers to the local government. Mala Kachallah was elected governor of Borno State in 1999 under the flagship of the then APP(All Peoples Party) later ANPP. Ali Modu Sheriff was elected governor of Borno State in Nigeria in April 2003. He is a member of the All Nigeria People's Party (ANPP). Ali Sheriff was the first governor in Borno state to win the seat two consecutive times. On 14 May 2013, President Goodluck Jonathan declared a state of emergency in Northeast Nigeria, including Borno State along with the neighboring states of Adamawa and Yobe. This happened after fighting between Boko Haram and the state armed forces killed as many as 200 people in the town of Baga. 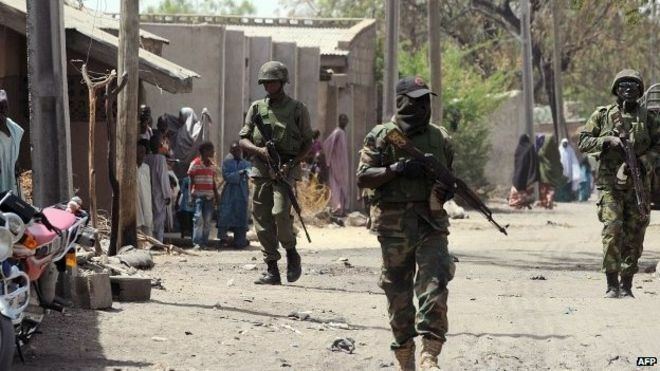 A spokesman for the Nigerian Armed Forces declared that the offensive would continue "as long as it takes to achieve our objective of getting rid of insurgents from every part of Nigeria." In July 2014, Borno state governor Kashim Shettima said that "176 teachers had been killed and 900 schools destroyed since 2011." After the Chibok schoolgirls kidnapping in April 2014, most schools in Borno State were closed. They were scheduled to reopen in November 2014. In November 2014, UNICEF reported it has increased its Community Management of Acute Malnutrition (CMAM) centres in Borno State "from 5 to 67 and is planning to increase this to 100." In Borno State, the agricultural sector has suffered mostly because of the ongoing Boko Haram Insurgency since 2009 and many people experienced acute food insecurity. In addition, there are seven Emirate Councils (Borno, Dikwa, Biu, Askira, Gwoza, Shani and Uba Emirates), which advise the local governments on cultural and traditional matters.